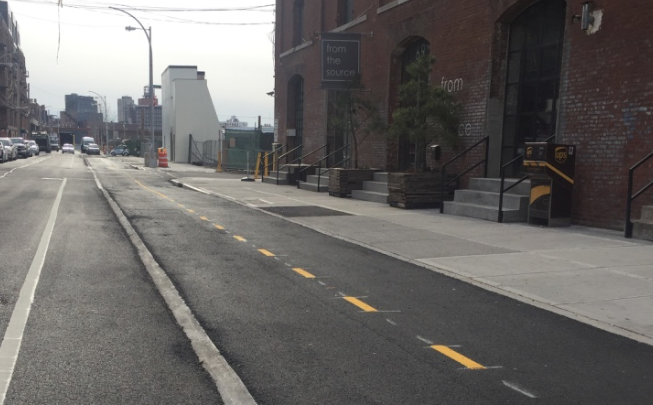 Why is it so important for bike lanes to have physical separation from traffic? Because without it, you never know when a two-ton metal box is going to fly across your path. The photo above was snapped on 59th Street between First Avenue and Second Avenue and posted to Twitter by Dirk Peters last night. If those Jersey barriers weren’t there to protect the westbound bike lane, this might not have turned into a story about bike lane design — it could have been about someone on a bike getting seriously injured. 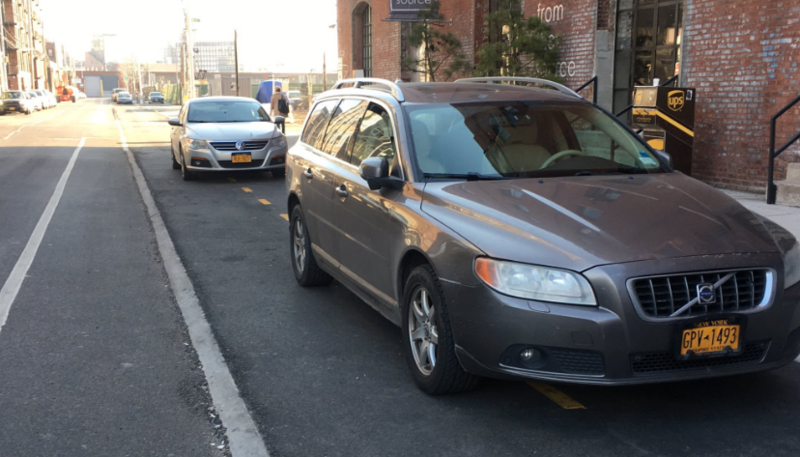 Meanwhile, on West Street in Greenpoint, where the Department of Design and Construction has installed seven blocks of the Brooklyn Waterfront Greenway, you can see the other downside to going without protection: Motorists turn the bike lane into a parking lot. The bike path is in serious need of physical barriers, judging by these photos that Doug Gordon posted on Twitter earlier this week. 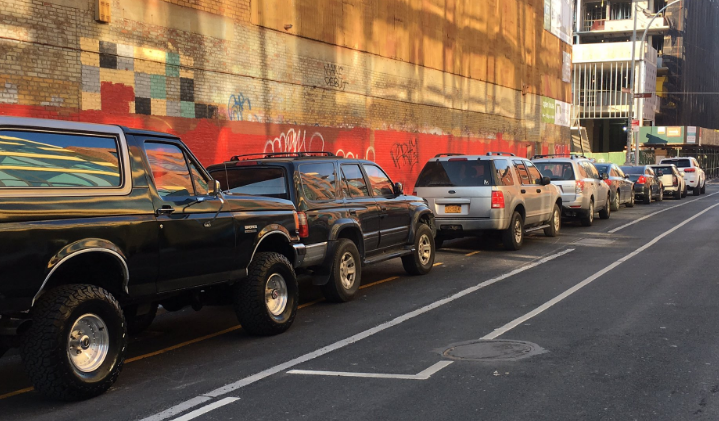 Between Noble Street and Milton Street, the entire path was filled with parked cars. Clearly, motorists abhor a vacuum. The design here called for a mountable curb but no other physical separation. That’s not going to be enough. To make this section of the greenway a viable bike path, Jersey barriers, heavy planters, or some other form of protection will be needed. Pouring a raised curb over that buffer space, a la South Street, should be the absolute minimum treatment. Besides physical protection being necessary for this portion on West Street, DOT should look at continuing the two way protected bike lane on Kent Ave north on the west side of Franklin Street to Quay Street in order to connect with the West Street Greenway. Not sure the “soft hit” posts are any better. Real protection consists of something which will physically damage or destroy motor vehicles if they go where they’re not supposed to go. At a minimum protection should consist of deeply buried bollards spaced no further than 5′ apart. Jersey barriers or strong fences are even better. Why don’t they just put a towing bounty and fine on the cars parked there? Yeah, I wasn’t advocating for soft-hit posts, and I completely agree that more substantial protection is needed. Are they not already connecting this to Kent? It would be ridiculous if they didn’t. There’s already the on street bike lanes there between moving traffic and parked cars, not protected. This would cause northbound cyclists to cross Kent/Franklin twice in order to access the West St Greenway, as opposed to keeping cyclists on the west side of Franklin, which would reduce conflicts. You don’t think think there would be lots of crashes if you switched to a regular curb at some point? Mountable on the bike side is good, mountable on the car side is bad. Ideally there would be a curb in between the bike path and the street that is higher than both. Cycletracks protected by elevation only don’t seem to work very well without exceptionally well behaved drivers (Denmark?). Even with a curb in between it might be necessary to add bollards in some locations. Closely set flexible barriers or the hard plastic ones are pretty effective. Too wide though and drivers squeeze into the restricted area. Bollards or planters are the best for protection from an out of control vehicle. Overall, painted lanes in this city have been a failure, they need physical protection. Hah! Whatever will people weaving errantly in and out of bike lanes do??? The Department of Transportation said it uses a definition of "protected bike lane" that allows a route to be called "protected" even if there is no physical barrier.